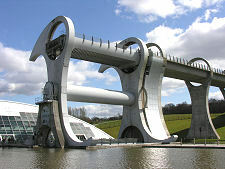 The Falkirk Wheel was opened by the Queen in May 2002. Nothing like it has ever been built before anywhere in the world. 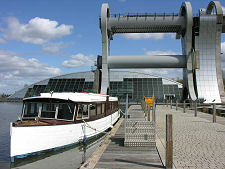 Boat lifts are nothing new, though the last built in the UK was in 1875. But a rotating boat lift? The result is awe-inspiring and beautiful: the largest piece of functional sculpture you will ever see. In the pre-railway era the Central Belt of Scotland had two main canals. The Forth and Clyde Canal opened in 1790 and allowed ships to sail the 35 miles between the Clyde at Glasgow to the Forth at Grangemouth. 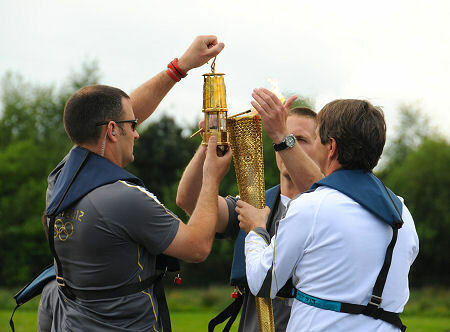 En route they negotiated 40 locks and 32 swing bridges. The second main canal, the Union Canal, opened in 1822. It started in Edinburgh and followed a contour at 73m above sea level for some 30 lock-free miles through the coalfields it was designed to serve to Falkirk. At Falkirk the two canals were linked together by a ladder of 11 locks that allowed boats on the Forth and Clyde Canal to climb the 35m to the level of the Union Canal. These canals eventually went the way of most of Britain's canals, and the lines of both were cut by road building and housing development following their closure in 1965. The late 1990s saw a resurgence of interest in the use of canals for leisure, which heightened further when developers began to realise how the presence of a canal could greatly enhance the desirability of an area as somewhere to live and work. And so was born the idea of the "Millennium Link", the complete refurbishment of the Forth and Clyde Canal and the Union Canal. Just about every bridge and lock on the network needed major work, and stretches of canal had been filled in during the construction of 1960s housing estates in both Glasgow and Edinburgh and had to be dug again. And in one place the M8 motorway had to be raised to provide clearance not thought necessary when it had been built over the disused Union Canal. 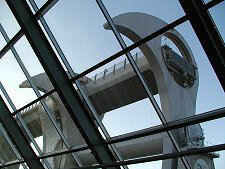 The total budget for the Millennium Link was £84.5m, £32m of which came from lottery funds. By far the largest single element, £17.5m, was spent tackling the problem that had first been encountered in the 1820s: how to bring the two canals together. The site of the original flight of 11 locks had been redeveloped, and while 11 locks might have been an acceptable solution for professional boatmen in the early 1800s, it was hardly likely to be attractive to the leisure sailors of today. 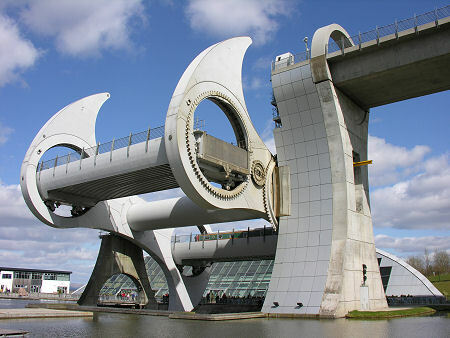 The solution is the Falkirk Wheel. 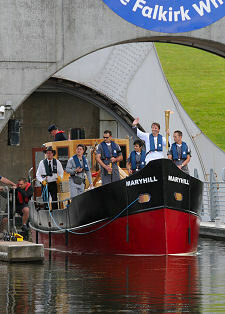 Boats approaching from the higher Union Canal now use a new length of waterway before descending through two locks. 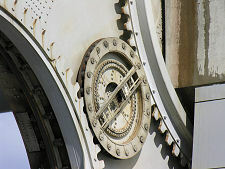 They then progress through a new 168m long tunnel that emerges at the start of a 104m concrete aqueduct. 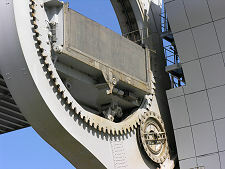 The far end of this opens directly into the upper of the two "gondolas" of the Falkirk Wheel. 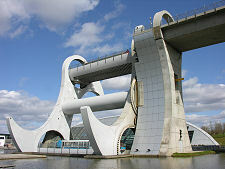 Most visitors make their way to the Falkirk Wheel by road rather than by canal. It is well signposted from every approach to the Falkirk area. 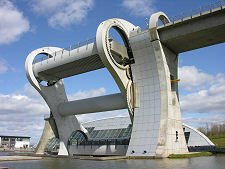 Entrance to the visitor centre is free, and inside you will find a range of background material on the Millennium Link and on the Falkirk Wheel itself. 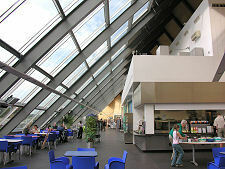 You will also find a large shop and a cafe selling a range of good value food. 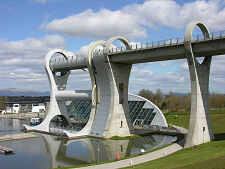 But it is the Falkirk Wheel itself that draws visitors to this spot. It is 35m or 115ft high, the height of eight double-decker buses. Each gondola contains 300 tonnes of water, meaning that the wheel moves 600 tonnes on each lift. But because the gondolas are always in balance (because boats displace their own weight of water) moving them takes surprisingly little power. Up to eight boats can be carried at any one time. And while many visitors will be happy simply admiring a remarkable structure designed both to look good and function well, the real experience only comes from trying it out for yourself. Details of boat trips are set out on the right. You board your hour long trip in front of the Visitor Centre before being lifted in the wheel to the length of canal through Roughcastle Tunnel. 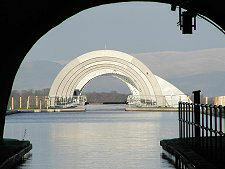 Beyond the tunnel your boat turns, before returning through it and descending via the wheel. Advance booking of boat trips is highly recommended. And if one wonder of its age is not enough for you, footpaths from the Falkirk Wheel take you a little over half a mile to Rough Castle Roman Fort, complete with one of the best preserved stretches of the Antonine Wall. Lime Road, Falkirk, FK1 4RS. Tel: (Booking) 08700 500 208.